Austin Balcam, the son of Al and Sandra Balcam, of Coral, and a third-grader at Beach Elementary in Cedar Springs, was excited to go out fishing on Lake Michigan, out of Muskegon, on August 11, with his dad and two friends. Austin was the only one to catch anything and needed help reeling in this King Salmon, 36-inches, 26 pounds, and 23-inches around. He was so excited and tired! 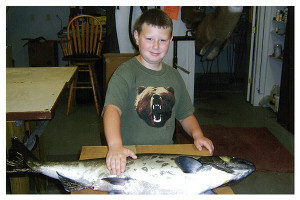 His parents are having the fish mounted for his bedroom. Congratulations, Austin, you made the Post Catch of the Week!